Well, that was a disappointment. 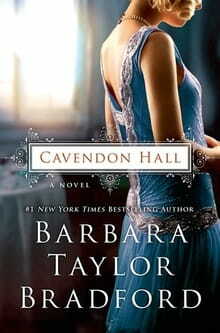 When I heard that Barbara Taylor Bradford, “one of the world's best loved storytellers” (according to her Amazon biography), and author of one of the top-ten bestselling books of all-time (A Woman of Substance), had written a new novel, I couldn’t wait to read it. Especially after I heard the author interviewed on NPR, where she explained that her new book was the story of two families: the Inghams, who lived in Cavendon Hall, and the Swanns, who served them. Perfect, I thought, a sort of Downton Abbey, Upstairs-Downstairs-esque story in novel form. What could be better? The story is pretty much a fairy tale without a worthy villain. Once upon a time there lived a beautiful family whose outer beauty was only matched by their inner nobility. They were served by another equally beautiful family whose calling was to serve and protect their masters. Throughout the generations, never was a harsh word exchanged between the two families. First of all, the relationship between the families is wildly unrealistic. Swann children were educated alongside their noble employer’s offspring and occasionally invited to join the family at tea. What? Servants dining alongside family? Apparently at Cavendon Hall, social status is a moving target. Of course this favoritism never seems to cause issues with the other staff—it’s all sweetness and light below stairs as well as above. These characters spend a lot of time telling each other things they already know for the readers’ benefit. It makes for stilted dialogue, to say the least. In addition the earnest charm displayed by virtually everyone made them all sound in my head like Shirley Temple in her Hollywood prime. Golly gee, that gets old really fast. Even when something truly awful happens to one girl she recovers with remarkable swiftness and her little problem is neatly swept under the rug by virtue of a hero who shows up just in time to be blown away by her loveliness. Naturally. While there are a couple of characters who don’t quite match the Disney princess perfection of the rest, they’re quickly shooed out of sight. The leading Swann of his or her generation is tasked with keeping an Ingham family history of sorts. Inghams themselves are forbidden to read this tome; naturally they all just accept this and go on their merry way. With so many dark family secrets inside, that book must have great blackmail material, but none of the loyal Swanns would ever dream of turning on their masters. Pity. It would have made for a much better story if they had.